If I could only have one exposure in which to grow plants, it would be eastern. Right now I have two sets of east windows available for plants in my house, in the kitchen and the master bedroom. 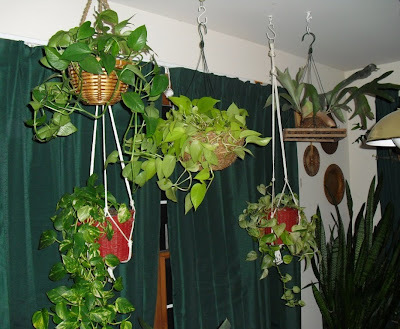 There is a third set in my stepson's bedroom, but since it is his room, and he prefers to keep his curtains drawn much of the time, the "Crazy Plant Lady" doesn't impose any plants upon him. Kitchen windows. Right now, I have three types of Epipremnum aureum hanging there, ('Jade,' 'Marble Queen' and 'Golden') as well as my Platycerium (Staghorn fern.) The large Sansevieria trifasciata is in the corner between the east window and my home's sole south window. My bedroom window shelves last year. The arrangement has changed since then. For one thing, the Epipremnum aureum 'Neon' seen on the top center shelf is the same plant that is now hanging in the kitchen window. The reason I am so fond of this is exposure is that I have found that most foliage plants will thrive in morning light. It is bright enough in all seasons for plants that prefer medium light levels. It is generally not too bright for plants that prefer low light levels, except perhaps in late spring to midsummer, when moving them back a bit so they are not directly on the windowsill can be good. And I have found that many plants that supposedly need high light do fine there. My Hoya carnosa has bloomed there two years in row. Last year, my Hibiscus rosa-sinensis plants overwintered well in the bedroom shelves (plants in the large red pots in the center section above) and started blooming in late February. In fact, I think that one of the reasons that I got into plants in the first place was because of the unobstructed east window in my bedroom as a teenager. Even though I was fairly ignorant of good plant care back then, especially the importance of good lighting, most of the plants I tried did well for me. I think that was because of the excellent, but not harsh, qualities of morning sun. Success breeds confidence, and made me all the more eager to try new plants. I will note that all my growing experience has been in the Northeastern states and in Illinois. It may well be that farther north, and farther south, eastern exposures might pose challenges for houseplant enthusiasts that I haven't encountered. Wow, how do you clean that bedroom window? I've been tempted to make shelves several times, but that's what always stopped me. Jealous of all your hanging baskets, too - I'd love to have some, but drilling holes in the ceiling is just too much bother. I'm supposed to clean them? Seriously, though I haven't done it in a while, the horizontal shelves in the center of the unit are removable, and the windows can be tilted inward so the outsides can be cleaned. There are three separate windows, each one well within the vertical portion of the shelves, so they can be accessed easily. I love my plants, but if I need to escape my bedroom in an emergency, they can be quickly shoved aside. I should mention that my husband Bob built those shelves for me while we were engaged, in anticipation of me, and my huge plant collection, moving into his house. That's nice of him! And well thought-out, too - might have to copy this idea some time. If I can build bookshelves, I should be able to build plant shelves, right? Oh, and thanks for your comment on my blog!